It's no secret that the Muppets are owned by Disney. Purchased in 2004 from the Jim Henson Company, the recent relaunch of the "brand" has been entirely the work of the House of Mouse. What is perhaps less well known is that Henson, as one of the last substantial acts before his death, attempted to sell his entire company to Disney. In Brian Jay Jones' recent and pretty terrific biography of the Muppet creator, he devotes the penultimate chapter to Henson's intended merger with the then Michael Eisner headed company. While the merger didn't happen in the early days of the 1990s, after reading the specific details I began to wonder how much of an effect the failure of the deal had on the more recent acquisitions of Pixar, Marvel and Lucasfilm (which celebrated it's one year anniversary earlier this week). After the jump, I'll take a look at these three huge purchases, and see if they are in fact the product of the Henson legacy. 1989 wasn't a great year for Jim Henson. Coming off the combined failures of The Jim Henson Hour and Labyrinth, as well as feeling the pressure of being the sole head of a growing and dynamic company, Henson was in a period of quiet depression. While he continued to work, something of the zest had went out of him. In a moment of introspection (and oddly nostalgic legacy building), he decided that he would sell his company to Disney. Surprisingly, this was not the first time Jim had tried to make a deal with Disney, just the other way around. I didn't know this until I read the biography, but in 1984, when Disney was near bankruptcy, Henson had enquired about purchasing Disney and installing himself as President (yes, Henson's company was just that successful in the waxing days of the 1980s). 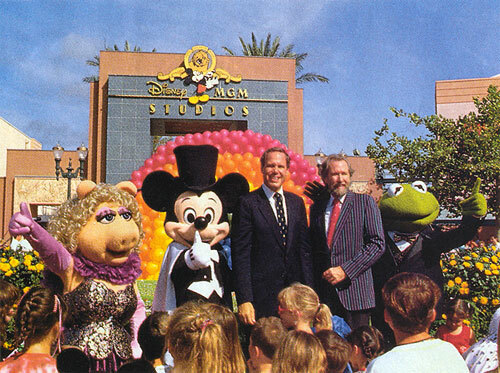 Disney was on stronger footing in '89, and Michael Eisner, an old friend of Henson, was in charge. On Monday, August 28th, 1989, Henson and Eisner would jointly announce the merging of the two companies live on TV, as seen in the page top image. The deal was tentative, the only promise of it's success a principle-in-agreement contract, and a personal handshake between the two men, the latter of which Henson valued more. Disney would absorb Henson wholly, including all properties, merchandising, copy and character rights except for Sesame Street and Kermit the Frog. The price of this merger? $150 million in Disney stock (just shy of $300 million in today's money). Disney was getting the best end of the potential deal, which would have seen them get 100% of the very profitable Muppet Babies merchandising, as well as Jim's cut of the Sesame Street merchandise. And, most importantly, they would get Henson himself, which Eisner described as bringing a "creative vitality," and would make Henson exclusive to Disney for 15 years. To prove this point, even while the deal was still being negotiated, Henson began working on redesigning areas of the Disney parks for Muppet features, and filmed the experimental Muppet*Vision 3D. Then he died. And with his death, Disney lost the largest contributing factor that made the deal appealing. Without his vision, or enthusiasm, and without his watchful eye making certain the lawyers didn't get too close to Sesame Street, and with a sizable estate tax now owing against him, Disney backed out in December of 1990. In 2004, partly out of desperation of the now fledgling company, Lisa and Brian Henson would sell The Muppet Show Muppets to Disney for an undisclosed amount (though probably close to $80 million). The Henson's would, and continue, to own The Fraggles, Dark Crystal, Labyrinth, The Storyteller, and the Creature Shop (Sesame Street is now wholly owned by the former Children's Television Network). It would be the last major acquisition for Disney that Michael Eisner would make before being ousted from the CEO position in 2005. Since then, Disney has made three very high profile and very expensive purchases. The first, in 2006, was Pixar, in a deal worth $7.4 billion. The second, in 2009, was Marvel Comics, for $4.24 billion. And almost exactly a year ago, the surprising announcement that Disney had bought Lucasfilm for $4.06 billion. Even with inflation, these are considerably more than Henson was offered for his company, which in 1989 was as successful and robust as Lucasfilm (or at least, reasonably comparable). In fact, Henson's business manger at the time disliked the Disney deal because he felt it was too cheap. But more than that, I believe that new Disney CEO Bob Iger learned a lesson from Eisner's prior failure with bringing the Henson Company into the fold. First, don't announce the deal until the deal is pretty much done. Henson and Eisner made their presentation in front of the world, and negotiations continued for a further year and a half before breaking down. The Pixar deal was announced in January, and completed in May. Marvel, announced in August, finalised in December. Likewise, Lucasfilm was announced in October, and finished in December. And you can bet that a significant amount of the due diligence had already been completed before the deals were made public. At least, to the point where the deal was unlikely to fall apart. Shorter finalisation periods also create more stable stock performances, as there is less uncertainty amongst investors about changes in the deal, and less fluctuation in the stock price. An acquisition deal usually results in better stock performance, but a prolonged deal will inevitably result in a decline, as worried investors play it safe and pull out. Second, respect the talent you are buying. Eisner had described Henson as "creative vitality," and that notion has been part of logic behind these purchases. Pixar's acquisition came at a time of misgivings between the creators and the distributors. Michael Eisner had been hostile towards the animation studio, whose films had represented the greatest theatrical profits and critical respect for Disney since the mid '90s. Eisner was of the position that Pixar needed Disney more than Disney needed Pixar, and Pixar was willing to call their bluff and seek a distribution deal with someone else. Iger recognised that Disney's brand had become irrevocably intertwined with Pixar's, and that the House of Mouse would suffer more from letting the company jump ship. Once the acquisition was finalised, John Lasseter was installed as head of Disney Animation, signifying the respect (and success) Iger had for what Lasseter had accomplished. 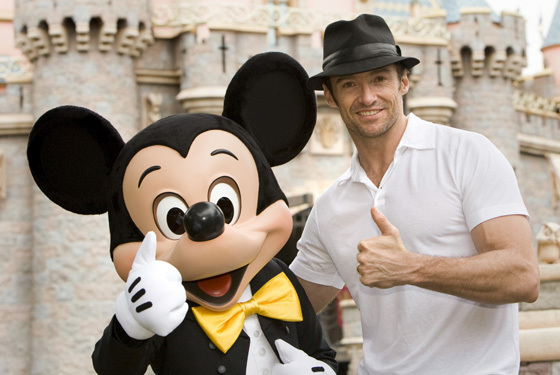 And to guarantee Disney's own continued success. And while the Lucas deal was in part motivated by George's decision to semi-retire, he has been kept on as a consultant in regards to the in-development Star Wars content. Marvel has remained largely autonomous, but no doubt Kevin Fiege's expert guiding hand as the force behind the MCU films is a position that, come contract negotiation time, is probably safe. Third, buy everything. A sticking point in the original Henson deal was not getting the Sesame Street rights. By the time they were able to get their hands on the Muppets in 2004, Sesame Street was already gone, and nothing else at Henson was as profitable as it had been. From 1995 to 2006, all of the films Pixar had made remained wholly owned by Pixar. Characters like Woody and Buzz were allowed to be used in Disney parks for the duration of the distribution deal, but if Pixar had walked and made a deal with someone else, those characters would have went with them, despite any cultural association between them and Disney. The same was true of the Marvel deal, which included the rights to over 7000 original characters, of which only a fraction had been farmed out to other companies for film deals. This was also pre-Avengers, when the potential earnings from the original Marvel films was still only steady, but Disney saw the potential. With Lucasfilm, they not only got two well loved film franchises, but a film company, the most sophisticated sound production studio in the industry, a top level CG firm, a publishing arm, and a video game developer, all with proven success. As close to the Marvel deal as I could find. Fourth, use what you get. The previous theatrical Muppet film was released in 1999. The most recent was 2011. Between then, aside from mostly forgettable direct-to-video or TV specials, the Muppets weren't well utilised. Even after Disney bought them, they didn't really know what to do with them, under the mistaken impression that the world wide fame they had achieved in the '70s and '80s hadn't followed them into the new millennium. The Muppets proved that to be false, and a sequel was immediately approved. Muppetmania, on a smaller scale, had returned, because it hadn't really went anywhere. So, what did they do the day of the Lucasfilm announcement? Immediately announce a slew of new Star Wars films, unwilling to let the franchise potential go stale for even a minute. With Marvel, the increased protection that comes from having the backing of a major studio allowed for increased budgets and greater risk taking on Kevin Fiege's part, meaning that Joss Whedon was hired for the Avengers, soon we'll have a Guardians of the Galaxy film, and the next phase of the MCU will be filled with even more obscure and more risky characters, each with the potential to be the next Iron Man. And, Pixar animated films now share an equal (if not majority) share of Disney's annual output of films, and have since the acquisition. In the end, all of these were business decisions. These companies, and their properties, stand to make Disney a lot of money. That is the first and the final reason for buying them. But smart business decisions are made on the backs of memories of bad business decisions. Disney's recent and aggressive expansion, I believe, has a foundation built on the memory of having once had the chance to own what was at the time the most recognisable franchise in the world, and failing to make it happen. A situation they obviously refuse to put themselves in again.